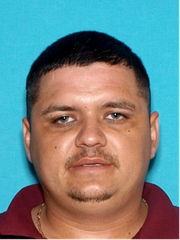 Lancaster Station Detectives are seeking the public’s help in locating Suspect Ramiro Garcia. He is being sought for an attempted murder that occurred on Tuesday, June 12th at 9:30 am. He also has been charged with domestic violence and stalking. He has an active arrest warrant for $1,100,000 dollars. Suspect Garcia is described as a 33 year old male Hispanic, approximately 5’08”, weighs 210 lbs., with brown hair and blue eyes. He was last seen driving a white newer model 2 door BMW with paper plates. If you have any information regarding incident or the the whereabouts of suspect Garcia, please call Lancaster Sheriff’s Station Detective Clark at 661 948-8466.